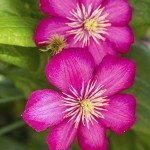 There are a couple of ways to classify clematis. One is by pruning group, and the other is as an evergreen or tender vine. There are also bush clematis plants, which are different than the vine variety. Whichever type you choose to grow, you can’t do better than a glorious clematis color show in your garden. Clematis is a familiar flowering plant with a great diversity of form, color and complexity. The plants have different bloom sites, so pruning by Class is important. Additionally, it is best to know if you have a bush or vine clematis, as support needs will vary and they should be trained when young. For year around greenery, an evergreen clematis can’t be beat. 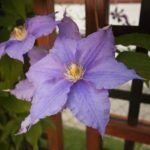 What Clematis Variety Do I Have? 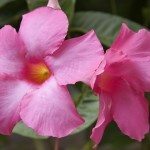 You may have inherited a plant and have no idea what kind is in your garden. This happens to new home owners quite frequently and they have to wing it on the care and pruning of the plant. The pruning class is the most important to know. This is because different types of clematis bloom off of different levels of growth. Class 1 clematis bloom off of old wood while Class 3 plants bloom off of new wood. The Class 2 clematis bloom off both old and new wood and produce blooms twice in the season. That’s why it’s important to know the pruning class or you may prune your clematis at the wrong time and cut off the wood that was supposed to produce the magnificent flowers. If in doubt, you will have to experiment by trimming at least a couple of vines and then watching to see if they bloom. The classic climbing clematis vines are probably most familiar to gardeners. However, there are also bush clematis plants that grow as shrubs or in upright forms. These grow 20 inches to 3 feet depending on species. Mongolian Snowflakes, Tube and Fremont’s clematis are examples of these. Trailing or rock garden clematis produce stems that crawl along the soil surface and make attractive ground covers. Some clematis varieties in this form would be Ground, Mongolian Gold and Sugarbowl. Beautiful but easy to grow climbing clematis vines such as Bees Jubilee, with mauve blooms, or C. macropetala, with blue flowers, produce blooms up to 5 inches across. Crimson Ville de Lyon and magenta C. viticella ‘Grandiflora Sanguinea’ will add vibrancy and punch to the landscape. Cultural care of evergreen clematis is similar to deciduous forms. The beauty of these hardy vines is their glossy arrow-shaped leaves, which persist year around and form vibrant shields and accents. Evergreen clematis bloom in late winter to early spring and in temperate climates is one of the first vines to flower. The variety is Armand’s clematis and it produces heavenly white blooms with a gentle fragrance. Evergreen clematis is in pruning group 1. 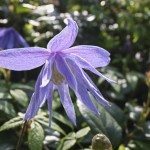 As with other climbing clematis vines, the plant will require training and support but is otherwise a no fuss alternative to the deciduous varieties.